For the star at the center of this system, also known as The Sun, see Sol (star). 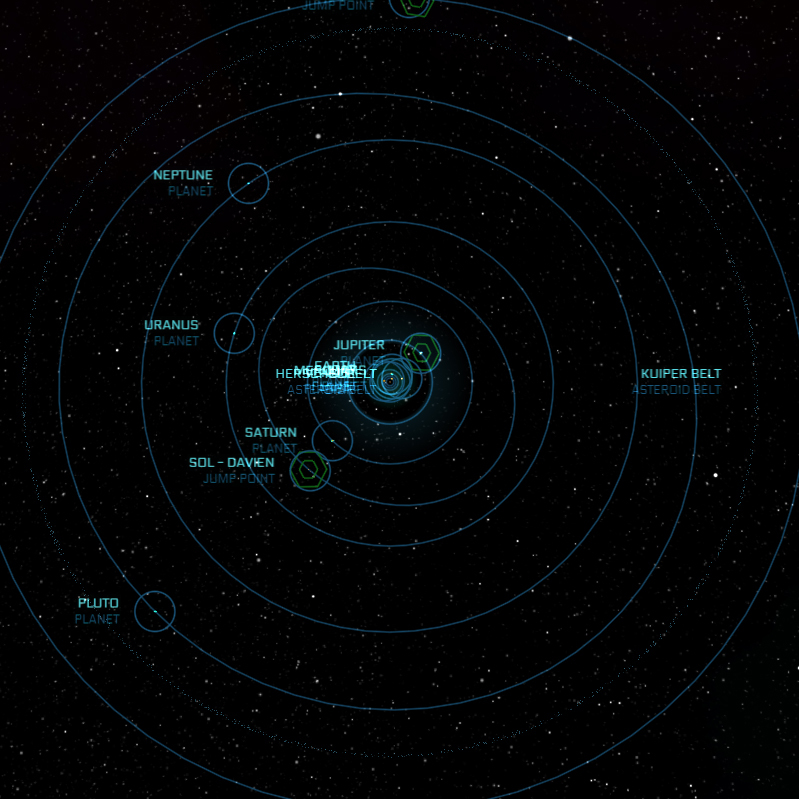 Sol (also known as Solar System) is the birthplace of Humanity and capital of the Empire. The Imperator, Senate and many other major UEE institutions are based on Earth (Sol III). Among the many historical milestones that the system can lay claim to is the first ever terraformed planet, Mars (Sol IV). Due to an orbital eccentricity, this small planet experiences the greatest temperature variations of any planet in the system. Venus' atmosphere is almost entirely composed of carbon dioxide, which makes it the hottest planet in the Sol System. Humanity's homeworld and namesake of the United Empire of Earth. It is the center of the UEE political machine and a focal point in the Empire's commerce and culture. Centuries of habitation have stripped the planet of its natural resources resulting in a heavy dependence on imports for the billions that live here. A prosperous and populous planet, Mars was the Empire's first successfully terraformed planet. The process was marred by what is today known as the Mars Tragedy when a terraforming disaster killed 4,876 people in 2125. This gas giant is the largest planet in the Sol System. A gas giant best known for its set of planetary rings. This ice giant has an unusual lopsided magnetic field due to a dramatic tilt of its axis that places its north and south poles where most other planets have their equator. An ice giant whose differential rotation contributes to it having the strongest winds in the Sol System. This dwarf planet was the first major Kuiper Belt object to ever be discovered and is primarily made of ice and rock. Also known simply as 'The Asteroid Belt', the Hershel Belt is located between Mars and Jupiter and contains objects such as Dwarf Planet Ceres. The Kuiper Belt lies beyond Neptune's orbit and contains objects such as Pluto. A planetary asteroid belt orbiting Jupiter. A planetary asteroid belt orbiting Neptune. A planetary asteroid belt orbiting Uranus. Orbiting between Saturn and Uranus next to the Sol - Davien jump point, this orbital Naval base acts as the main operational center for the main Sol fleet. Orbiting outside the Kuiper Belt, next to the Sol - Croshaw jump point, TDD Kesner is a major shipping hub where most cargo moving to Earth is first processed - to help alleviate congestion on the Empire's capital world. Though it is no longer in active service since the Marine forces stationed here were reassigned to Mars, the base remains strictly off limits.